Emergency services are available 24/7/365. If this is an emergency, please call 708-921-5284. Lukas Equine Veterinary Service provides equine sports medicine services, including diagnostic lameness and performance evaluations. Lukas Equine has knowledge and background in various equine disciplines. Lukas Equine Veterinary Service understands the various demands of the equine athlete. 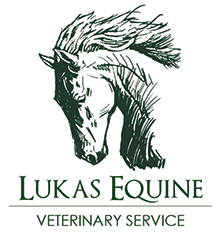 Lukas Equine Veterinary Service is equipped with digital radiology and ultrasound. Local or intra-articular anesthesia (blocking) is performed along with digital radiographs and/or ultrasound to diagnose the lameness at hand. The radiographs are taken and viewed on-site. Being on-site helps to diagnose specific lameness issues quickly and effectively. Once the specific lameness is diagnosed, Lukas Equine is capable of devising a treatment plan specific to the current case. Some treatment plans may include, but are not limited to, an exercise regime, physical therapy/stretching, therapeutic medications, further diagnostics, and/ or intra-articular (joint) therapy. Lukas Equine is committed to providing the most up to date high quality care and treatment for your horses. For an equine sports medicine appointment or lameness evaluation, please contact us at your earliest convenience.